Back in 2007 our Retriever mix, Xena, got some bad news--Liver cancer; inoperable--an uncertain prognosis. Shortly before, it had been my turn. I was the lucky one. The good news is that the condition of our health put me in the driver's seat. It was time to research the causes and learn more about how to protect the rest of my family. I did a lot of reading--more than I care to remember. What I learned probably won't shock you. We're poisoning our Earth. That beautiful green lawn that our Xena enjoyed lounging in daily was probably her undoing. Fertilizers, weed killers, anti-fungal treatments, pest control, and more were all there. Throughout Xena's life she had suffered from hotspots, always on her hips. As I began to understand the likely causes of her cancer, it was easy to see what was causing the hotspots as well. No sooner did we locate and integrate organic lawncare did we also see an immediate change in Xena's skin issues. Gone; vanished. She never had another hotspot or wore another cone for her final 3 years. Three years? You must be wondering how she lived 3 years after a poor prognosis and inoperable cancer. Her doctors explained that by removing toxins from her environment and her food, we reduced the strain on her liver. With less filtration work to do, her body was able to sustain a slowing of the tumor's growth. Until the day she passed, Xena was a happy, seemingly healthy dog. In the end, it hit her fast and was over quickly. I couldn't have asked for more. 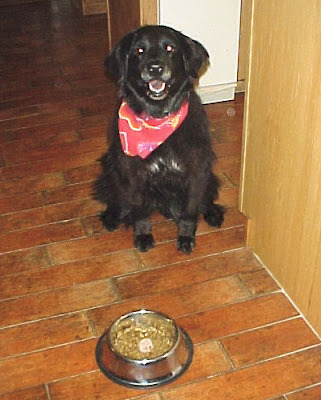 Removing toxins from Xena's food was a matter of moving to organic chow. There were options, and I'll explain my decision process in an upcoming post. For now, suffice it to say that the cleansing of her diet had the same effect on her liver. short, Xena's body was no longer under attack and the combination of these changes clearly bought her another 3 years of life. Join me for more in this series as I share the details, explain how simple many of our strategies are to employ, and help you find ways to make changes in your own lifestyle that will add years to your life and your pets' lives as well. Next up we'll talk first about reading pet food labels. Join me in two weeks for that educational article. As an NB Insider, I share information and news about Natural Balance. This series will offer some of our reasoning for choosing their organic formula. While I am compensated with sponsored travel and pet food in exchange for sharing my thoughts, the opinions and information is 100% completely my own. Our ignorance will kill us and our pets. I'm looking forward to read more posts like this one. Very good piece. Thanks. I am convinced that the use of everyday commercial products is not only poisoning the planet, but ourselves and our pets. I recently switched to all "enviro-friendly, organic" cleaning and beauty products. I think it's extremely important not just for my 11yo canine baby but for me as well. Unfortunately affording organic food is out of the question but she does eat all human grade stuff in home cooked meals, no rawhide and no treats I wouldn't taste [at least] myself.